I used SU’s watercolor paper, giving the whole piece a wash of Soft Sky before I even stamped this little chickadee (which Maria tells me is from Stampendous...thanks, Maria!) in Black Stazon. I wish you could see the detail, he’s so sweet! The photo doesn’t really do it justice! I colored him with Basic Black, Smoky Slate and Crumb Cake; the berries are Real Red and Cherry Cobbler, and the snow has a little bit of Soft Sky; I also did some outlining with Pool Party. I love using my Aquapainter for these kinds of images! I added a sentiment in Smoky Slate, and although it’s difficult to see, a few snowflakes in the upper right corner because it looked a little off-balanced! And of course, I added some DD glitter to the snow! Cassidy liked the card from this angle, so here’s another photo! Love this card and that is the cutest little chickadee ever! LeAnne: this card takes my breath away, it's absolutely gorgeous!!! This sweet little Chickadee is just like the ones flying around the bird feeders in my back yard. Those colors are true to the real ones and your water coloring is stunning!! I can bet that the first card you made that you didn't like is just beautiful too. I'm going to go hunting for this stamp, I also think it's from Hero Arts. PS. Cassidy was very interested in this little critter, they look a bit scary but they are beneficial in your garden because they can catch other insects, I heard that you can keep them as pets.....ahh.....I don't think so, they are not huggable at all, LOL!! But it's good that Cassidy was able to see this one. Beautiful card LeAnne. Nice fall is in your area, it is still hot and humid in Southern California. 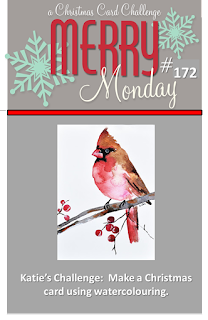 LeAnne: I just found this beautiful image, it's from Stampendous and I think the collection is called Winter Birds. I checked with Hero Arts but no luck, so I just Google'd it. Thank you again for sharing this beautiful card. So beautiful and I love the subtly stamped snowflakes in the corner. You did a masterful job on this card!! I am so impressed! Envy your cool weather - it's supposed to hit 97 in our neck of the woods! Hugs to all! Ooohhh I love that stamp and love your coloring just as much. Beautiful. Thanks so much, Maria! I edited my post! LOL, we're all enablers, aren't we?! Glad you found it! Happy Fall!!! This is a beauty indeed, LeAnne! I love the soft watercoloring effect your card has. The shadowing is masterfully done. I will have to see if I can play along this week... I think the return of fall has brought Mr. Mojo back (I can only hope!). He was MIA for very long time. What a sweet little Chickadee and a lovely card (as usual). The praying mantises brought back memories I haven't thought of in years. They could always be found in my grandmother's gardens and grandfather would tell us all sorts of stories about little fairies riding on them like horses. Awe and delight and lots of giggles would follow. Soooooo sweet - the capped berries, the pool party outlining is great - will have to try that - and birds are my favorite!!! I do love this. So sweet and such beautiful watercoloring! I love the DD on the snow, adds a great touch. Hope you and Cassidy had a great day! What do I think? I think it's gorgeous! Beautiful watercolor work! You are so talented! Love,the image of the sweet bird and the pop of the berries! I think it's beautiful! You've really captured the chickadee perfectly! I love how you've colored him and the little bits of sparkly snow look so real! Beautiful. Your color is fabulous. Love all the details on your card. This is so PRETTY LeAnne!! My husband loves to photograph the chickadees that follow him around on his photo taking outings. Hope you had fun with you little sweetie today!! Chickadees are my favorite bird - you did a fantastic job! LeAnne, that chickadee is absolutely fabulous and you colored it beautifully. Stunning card. The praying mantis - stunning, too. They used to scare the living daylights out of me, but I find them fascinating now. You always make such CUTE cards, Leanne. I would really LOVE to have you stop by and share your wonderful cards with us at Word Art Wednesday. It would be a tremendous blessing to have you link up with us there as well. I hope you will join us. Your card is gorgeous! Love that little Chickadee image and your beautiful watercoloring. Whose not good at watercolouring???!!! I love that cute little birdie - great job! This chickadee is a masterpiece, LeAnne! You've done an awesome job of coloring him! I have this stamp in my NBUS box. I really need to get it out! Oh my, how I love this image and the way you've colored and embellished it. Such a charming little bird on the lovely branch. You're watercoloring is perfect. Delightful LeeAnne, such a beautiful Christmas card. Thanks for sharing at Merry Monday. This is just beautiful, LeAnne. Your fluffy wee bird is just the cutest and you've colored him so well. Great to see you at Merry Monday. Beautiful card. Your watercoloring is fantastic. TFS.